See updates on this post for Annette Brooke MP’s Parliamentary Oral Question concerning ICD-11 and ME, CFS on February 25, and the Oral Response from The Parliamentary Under-Secretary of State for Health (Jane Ellison). Towards the end of January, ICD Revision confirmed a decision to postpone presentation of ICD-11 for World Health Assembly approval by a further two years, from May 2015 to May 2017, to allow more time for development and field studies. Caveats: The ICD-11 Beta draft is not a static document. As a work in progress, the Beta draft is subject to daily revisions and additions of textual content, to field test evaluation, and to approval by the International Advisory Group for the Revision of ICD-10 Mental and Behavioural Disorders, ICD-11 Revision Steering Group, and WHO classification experts. In an earlier post (Between a Rock and a Hard Place: ICD-11 Beta draft: Definition added for “Bodily distress disorder”) I reported on what is publicly known about the current status of proposals for the revision of ICD-10’s Somatoform disorders for ICD-11. This post updates on the status of the three ICD-10 G93.3 categories, Postviral fatigue syndrome, Benign myalgic encephalomyelitis and Chronic fatigue syndrome within the ICD-11 Beta drafting platform. Information in this report is derived entirely from the public versions of the iCAT > Alpha > Beta drafting platforms, not the collaborative editing platforms used by ICD Revision, to which the public has no access. 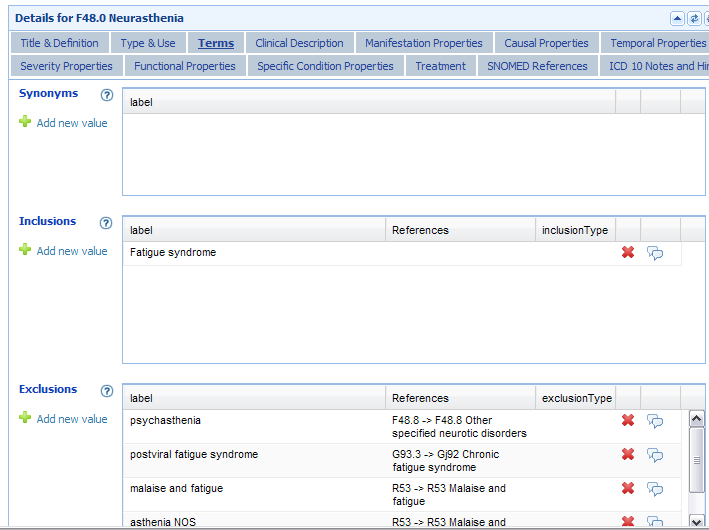 Within ICD-10, the three terms are coded or indexed to the Diseases of the nervous system chapter. In ICD-10, the Mental and behavioural disorders chapter (codes F00-F99) is numbered Chapter V.
The Diseases of the nervous system chapter (codes G00-G99) is numbered Chapter VI. Diseases of the nervous system chapter has been renumbered to Chapter 07. May 2010: iCAT preliminary drafting platform: For the chapter Diseases of the nervous system, this iCAT Discussion Note records a change in hierarchy for class: G93.3 Postviral fatigue syndrome. Its parent: G93 Other disorders of brain is being removed. New parent added: Other disorders of the nervous system. Additionally, this Change History note records that ICD Title term: Postviral fatigue syndrome is being replaced by new ICD Title term: Chronic fatigue syndrome. 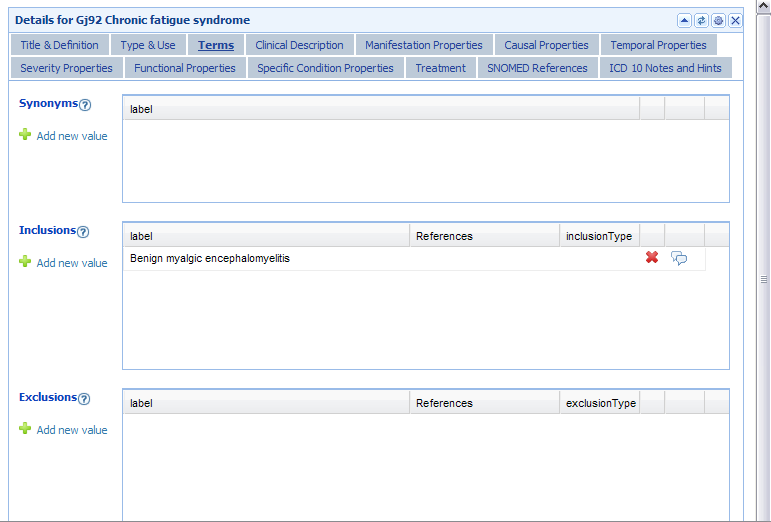 A Definition is inserted for new ICD Title: Chronic fatigue syndrome. Benign myalgic encephalomyelitis is listed as an Inclusion term to new ICD Title: Chronic fatigue syndrome. At this point, there is no listing of Postviral fatigue syndrome under Synonyms or Inclusions to ICD Title: Chronic fatigue syndrome, nor elsewhere within the iCAT draft, other than remaining listed as an Exclusion term to F48.0 Neurasthenia and R53 Malaise and fatigue. Benign myalgic encephalomyelitis remains listed as an Inclusion term to ICD Title: Chronic fatigue syndrome. The term Postviral fatigue syndrome remains unaccounted for. 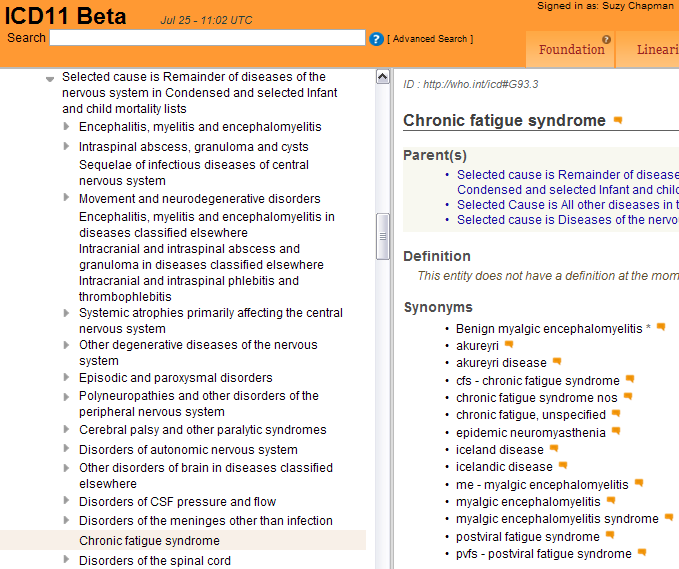 July 2012: Beta draft: ICD Title: Chronic fatigue syndrome can no longer be found as a child category directly under parent class: Other disorders of the nervous system. as here, in this July 25, 2012 screenshot. Other changes: The Definition field for Chronic fatigue syndrome is now blanked. Benign myalgic encephalomyelitis is listed under Synonyms and specified as an Inclusion term in the linearizations. 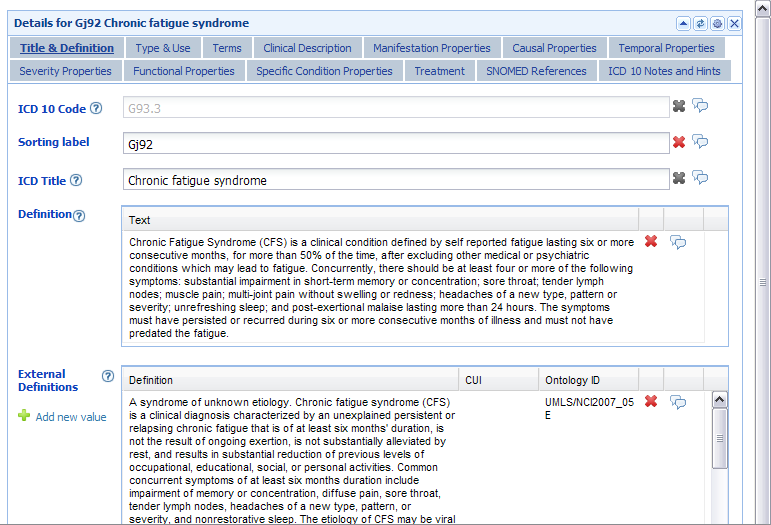 13 additional terms are now listed under Synonyms, including Postviral fatigue syndrome, and two terms imported from ICD-10-CM (the ICD-10-CM Chapter 18 R codes: chronic fatigue syndrome nos and chronic fatigue, unspecified). Chronic fatigue syndrome is characterized by extreme chronic fatigue of an indeterminate cause, which is disabling andt [sic] does not improve with rest and that is exacerbated by physical or mental activity. I have sourced this Definition to this ICD Revision Rare Diseases internal document titled: “Import_RD_definitions” (the Definition text is listed in this .txt file at “1983|Chronic fatigue syndrome|http://who.int/icd#G93.3…”). 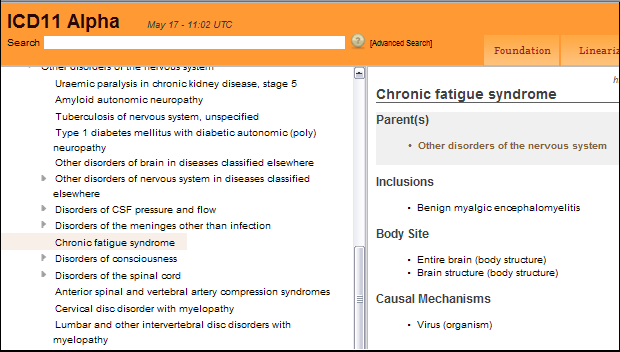 Since early 2013, no listing can be found in any chapter of the public version of the ICD-11 Beta draft, under any linearization, for any of the terms, Postviral fatigue syndrome, Benign myalgic encephalomyelitis or Chronic fatigue syndrome, as discrete ICD Title terms, or as Inclusion terms or under Synonyms to Title terms, or in the ICD-11 Beta Index. 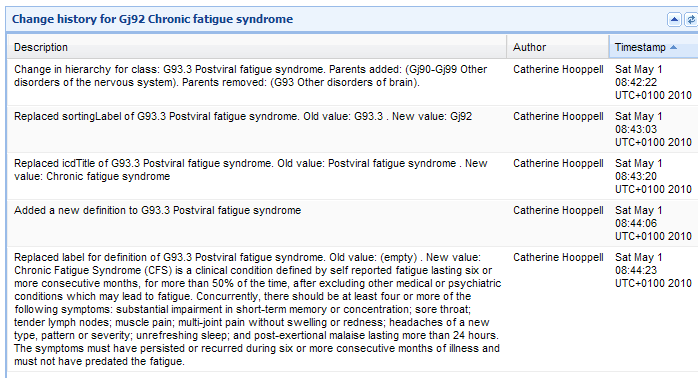 *In ICD-10, the Title term, G93.3 Postviral fatigue syndrome is also an Exclusion term to F48.0 Neurasthenia. But for ICD-11 and ICD-11-PHC (the primary health care version), the proposal is to eliminate F48.0 Neurasthenia or subsume it under a new, single, “Bodily stress syndrome” (BSS) or “Bodily distress disorder” (BDD) category, in Chapter 05, which is proposed to replace a number of existing ICD-10 Somatoform disorders. A Beta draft black hole? June 2013–February 2014: During this period I have contacted several key ICD-11 Revision personnel and the Chair of the Topic Advisory Group for Neurology, directly, with polite requests for clarification of ICD-11 Revision’s current intentions for the chapter classification, coding and hierarchical relationship for these three ICD-10 G93.3 entities. I have also submitted, via the public version of the Beta drafting platform, a number of requests for clarification and an explanation for their current absence from the draft. At the time of publishing, I have received no clarification from any quarter, either directly, or via the Beta platform. If the (now 12 month long) absence of these three terms is due to administrative error or oversight, then ICD Revision has had around a dozen opportunities, since last June, to respond to me with an explanation or to restore these three terms to the Beta draft. It appears this is an issue that no-one involved in the development of the Beta draft is prepared to be accountable for. (…) Currently, no entry for any of the terms, Chronic Fatigue Syndrome; Benign Myalgic encephalomyelitis; or Postviral fatigue syndrome, under any hierarchy, can be found within any chapter of ICD-11 Beta, in either the Foundation or Morbidity Linearization views, the PDF print version, or the PDF of the Index. currently proposed to be classified within ICD-11? 2. What is the current proposed hierarchy or relationship within ICD-11 between these three entities, in terms of Title term, Inclusion term, Synonym, and which of these three terms are proposed to be assigned a Definition and other “Content Model” parameters? 3. What is the reason for these three terms not currently displaying in the public version of the Beta drafting platform? 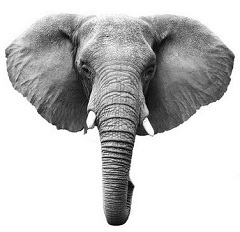 So why have these three ICD-10 terms disappeared and why is ICD Revision reluctant to respond? • There has been no significant change to proposals in the last 12 months, but the terms have been removed from the draft in order to mitigate controversy over the proposed change of hierarchy (i.e. whether a term is included as a Title term, coded for and assigned a Definition and other Content Model descriptions, or specified as an Inclusion Term to a coded term, or listed under Synonyms to a coded term) and/or over the wording of any proposed Definition or other Content Model descriptive text. • Topic Advisory Group (TAG) for Neurology intends to retain these three terms under Chapter 07, under an existing parent class that is still undergoing reorganization, and has taken these three terms out of the linearizations in the meantime. • TAG Neurology intends to locate the terms under a new Chapter 07 parent class which does not currently display in the linearizations in the public version of the Beta, or which does display but for which child categories have yet to be populated. • TAG Neurology intends to locate one or more of these terms under a parent class within a subset or sub linearization that cannot currently be generated within the public version of the Beta, for technical reasons. • Unlike ICD-10, multiple parents are allowable under ICD-11: TAG Neurology may intend to assign one or more or these terms to multiple parents within the same chapter, or to code to parents located under more than one chapter, for example, under parent classes, Symptoms, signs and clinical findings involving the nervous and musculoskeletal system or Functional disorders of the nervous system (located under both Chapter 07 and Chapter 19), and has removed the terms in the meantime in order to avoid controversy. 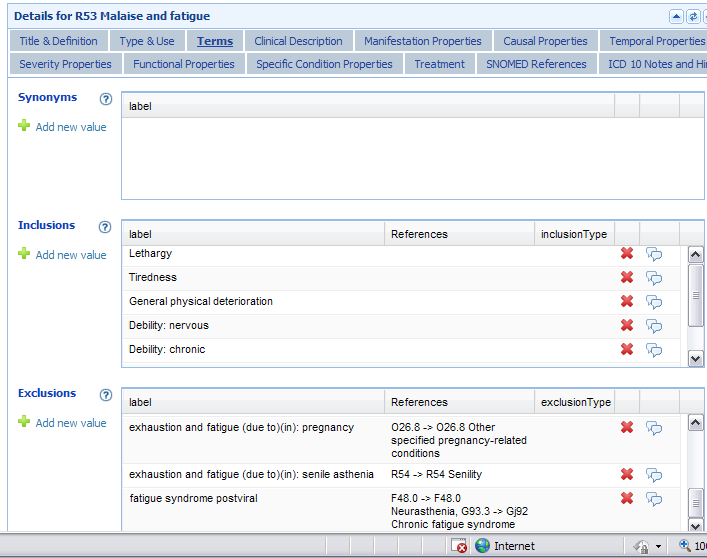 Many categories within ICD-11 are already coded under multiple parents where a disease overlaps two chapters, with the term in black text under the primary parent location and in grey text for the secondary or tertiary location(s), e.g. a skin tumor is both a skin disease and a neoplasm; diseases of the eye as a result of diabetes, or as a result of developmental anomalies. At one point, ICD Revision was discussing a proposal for a Multisystem Diseases Chapter. This has been rejected in favour of potentially assigning diseases that affect multiple body systems to multiple parents across overlapping chapters, or creating a specific linearization for multisystem diseases as a virtual chapter within the electronic version of ICD-11. TAG Neurology and TAG Mental Health may be under pressure from the Primary Care Consultation Group to adopt a proposed replacement for the ICD-10 Somatoform disorders that draws heavily on the Per Fink et al construct, “Bodily Distress Syndrome” (BDS). BDS is a single, unifying diagnosis that is inclusive of the somatoform disorders, and the so-called “functional somatic syndromes,” FM, CFS and IBS (which are currently discretely coded or indexed, within ICD-10, in chapters outside the mental and behavioural disorders chapter). Whatever the reason, ICD Revision has repeatedly dodged accountability and transparency for its actions. Having “disappeared” these three ICD terms from the Beta draft, with no explanation, WHO and the ICD Revision Steering Group are disenfranchising professional and advocacy stakeholders from scrutiny of, and participation in the revision process.